2)If You Have Any Questions About Our Product ,Please Don't Hesitate To Contact With Us,We Will Try Our Best To Reply You On Time . Dimension:14.17(L)*4.33(W)*10.24(H)inch,the shoulder staps total length:50inch(can be adjustable).please pay more atteneion to our dimension description. Material:Synthetic leather,lining material:Polyester,3 Colors to chose:black,pink,light brown. Interior:This bag is a perfect bags for outdoor activity.it has a zipper pocket to hold your coin,keys and other small things.there also has a main pocket to hold everything you want. Soft artificial leather backpack with magnet and drawstring closure. It has a nice sturdy and soft build. The shoulder and crossbody handbag with a classy, sleek, exterior. The bag is very nice and is made (sewing wise) very well. The sides maintain their shape despite how often I throw the bag around. Ultra-awesome. The soft bag is perfect for day-to-day use, and gift for everyone. 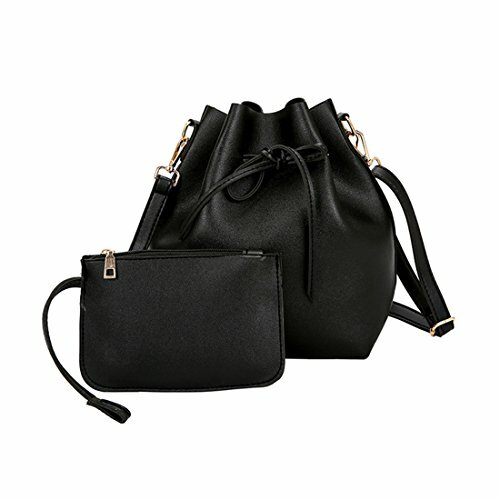 Also it's such an awesome shoulder and crossbody handbags that you will receive many cute, compliments from your family and friends. "Handcraft""Florence" Womens Vintage Style Genuine Leather Cross Body Adjustable Shoulder Bag Brown 11"